Every 15 minutes the ferry MV Bitten crosses between Hardeshoj in North Als and Ballebro, on mainland Jutland. We took the ferry after work one day when we had to go north for the weekend. 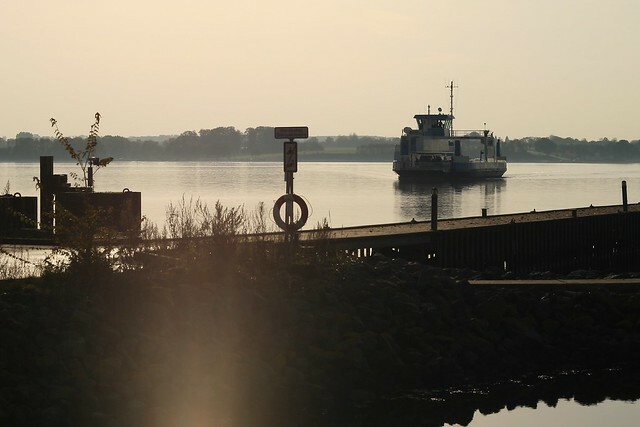 The ferry ride offers a scenic alternative to driving down south to Sonderborg to the 2 bridges that connect Als to the mainland. With the building of the new motorway, the ferry does not really save you that much time. However, it saves on the driving distance and would be especially handy if your destination is north Als or the Aabenraa area. On the day we took the ferry we were blessed with sunshine and great views for the 8 minutes or so that the ride took. It made it a pleasant way of starting a long trip (or at the end of one) as you get to relax and stretch your legs. I also liked the lack of stress and hassle involved with the trip: drive onto the boat, get out of car, enjoy the views, get back in and drive off. You pay on the boat to one of the employees, so no need to worry about buying tickets either. The trip costs 20DKK for an adult, 50DKK for a car+driver, and 70DKK for a car+ 5 adults. 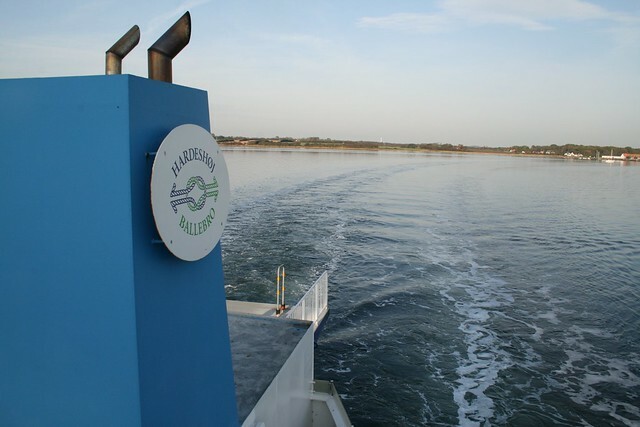 The ferry leaves from Hardeshoj at .00 and .30 and from Ballebro at .15 and .45. I guess with the motorway the ferry may soon see its end, but I dearly hope not! This entry was posted in Things To Do and Sights and tagged Ballebro, ferry, Hardeshoj, MV Bitten, north Als by Ann. Bookmark the permalink.